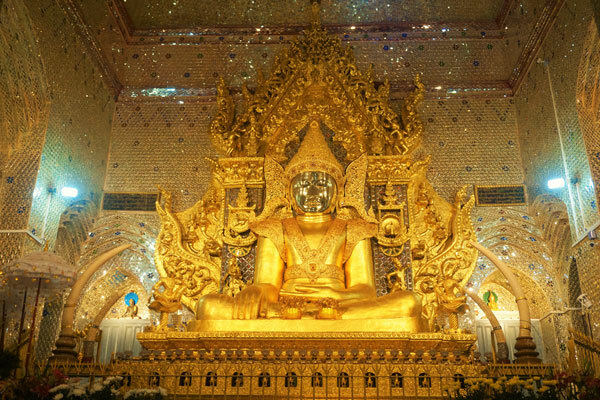 The name of the Golden rock-Kyaikhtiyoe is famous all over Myanmar. It is about 170 km distance from Yangon, located near Kyaikhto town of Mon state. People can reach there by car or train. It will take about four or five hours by car and more time is needed for the people who travel by train. And you have to transfer to mountain truck to reach near the summit of the golden rock for the rock is located on the top of the mountain about one kilometer above sea-level.There is also cable car service available between middle camp to mountain top. 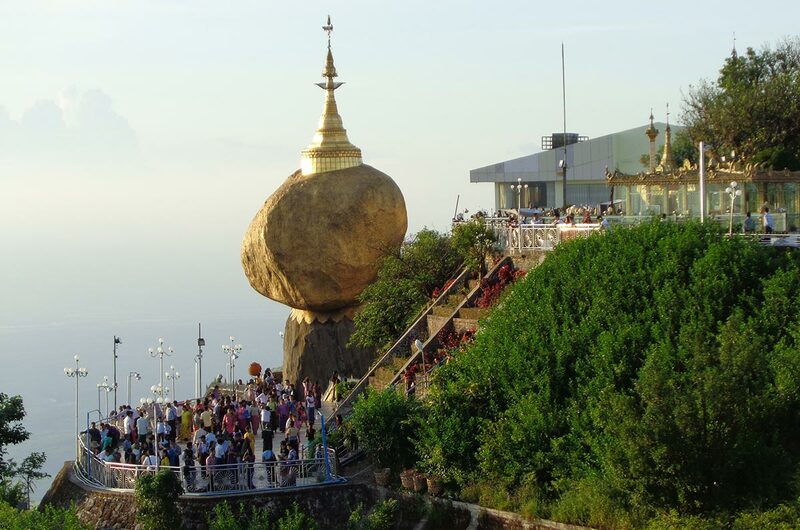 The golden rock is a big granite stone, coated with gold, position on a bigger granite stone. The upper stone is protruding to the cliffs side while the base stone is also leaning the same direction. Locals believe that the hairs relics of Buddha inside the stone prevent the stone from falling against the strong winds and earthquakes. There is a small village at the side of the Hpa An – Mawlamyaing road which has a cluster of beautiful religious buildings. These buildings were built by a businessman U Na Auk during colonial time. His successes came from trading of rice and timber before he went into a business war with Irrawaddy Flotilla company-a Scottish own transportation company. He built and donated the complex to the monks before his bankruptcy. The walls and pillars inside the building are covered with gold and the ceilings are decorated with murals, carving and hollow coloured-glass balls. These buildings are now under the care of elders from the village. The third most populated city in Myanmar is Mawlamyaing which was used to be a small fishing village before the British turned it into their administrative seat in the early 19th century. It was in this town, the history famous writers-George Orwell, Rudyard Kipling, found their inspiration. 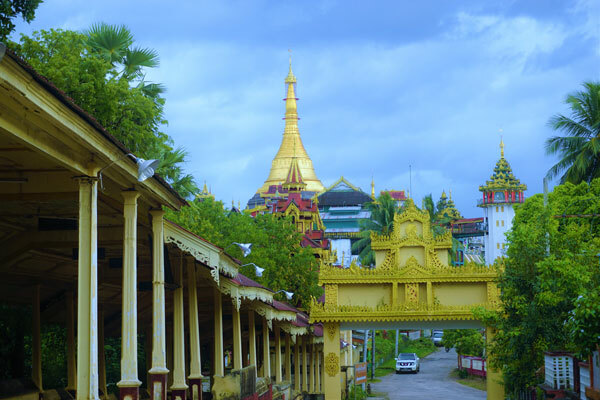 Today, Mawlamyaing is the administrative town of the Mawlamyaing district, Mon state, about 300 km away from Yangon.Even Mawlamyaing is well modernized for most part of the city; some parts still hold the colonial era ambience. It was widely believed to be the pagoda mentioned in the poem “Road to Mandalay” composed by Rudyard Kipling. The earliest record of the stupa existence can be dated back to 1527 when a king donated a bell on stupa platform. The location of the stupa makes it an ideal spot for sunset for it was built on the highest hill in the middle of Mawlamyaing city; overlooking the Thanlwin river with nearby Belu (ogre) island. Right next to the northern side of Kyaikthanlan pagoda, is the Mawlamyaing Maha Myatmuni Buddha image shrine. It was built in typical Mon style around 1904. The donor was the local businesswoman known as Daw Shwe Pwint. 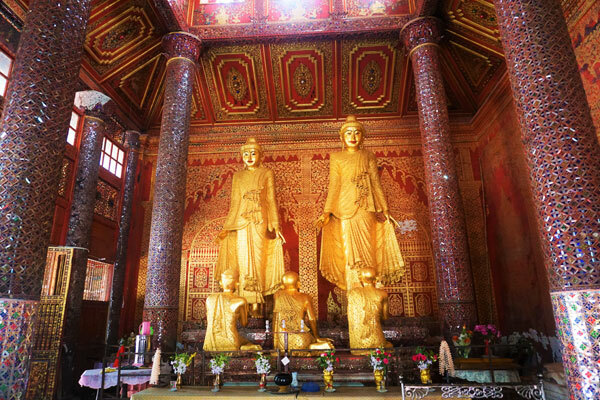 The image inside the shrine was casted in the exact likeness of Mandalay Maha Myatmuni Buddha image. They made a plaster impression of the original image and brought it back to Mawlamyaing. When it arrived, they casted a copy of impression and call by the same name Maha Myatmuni, the Holy Great Sage. The monastery is named after the Queen Seindon but the real donor was Daw Shwe Pwint. Queen Seindon was one of the fourtysixth queen of King Mindon and one of the few who survived the purge during the reign of King Thibaw. She escaped to southern part of occupied Myanmar. She decided to live in Mawlamyaing which is at that time the safest place under British administration. She befriended with Daw Shwe Pwint and must have given her advices in the construction of the monastery .She became a nun when she grew old and lived not far from the monastery. The monastery was richly decorated like a palace building. It also housed the furnitures nearly 200 years old with old parabeik-folded paper used around early 19 century. And, also housed an ivory throne to support the replica of Buddha tooth from Sri Lanka and a pair of beautifully carved elephant tusks. The monastery is under taking care of monks and it is polite to request permission from the monk to look around. Outside of Mawlamyaing,on the way to Thanbyuzayat, you will find an entrance flank by two giant cranes at the left side of the road. If you follow a few meters inside, you will be greeted by long row of monks statues numbering to 500. 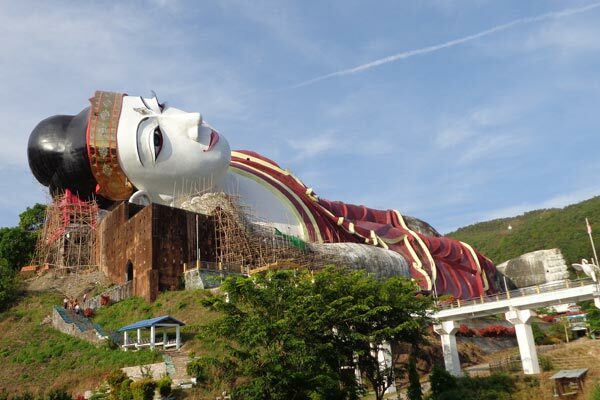 When you reach to the center of the compound, you will see the largest reclining Buddha in Myanmar. The Buddha image is a multi-storied building of 153 metres\500 ft long and 31metres\100ft tall, with exhibitions for Buddhist stories. All the statues and buildings were constructed by an Abbot, now deceased; however continues with donations from the devotees. This little town is about 40 miles\64km distance west of Mawlamyaing. This little sleepy town is famous because of its roles in World War II. 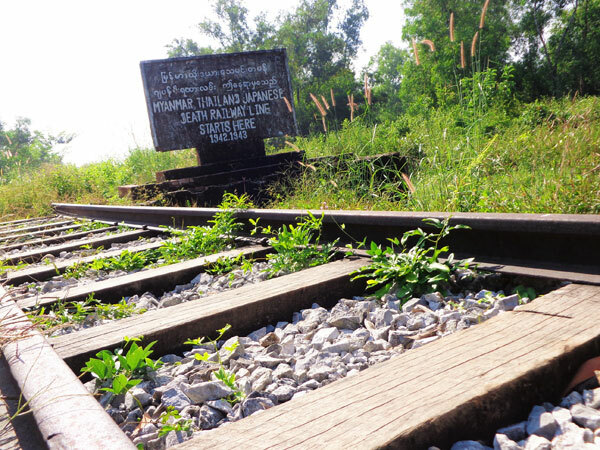 This town is the starting place in the construction of infamous railway line between Myanmar and Thailand, simply known as ‘Death Railway‘. The railway construction started in 1942 and finished in 1943. It took the lives of over 80,000 locals and over 10,000 allied POWs. Now, there is a museum dedicated to that sad event near the very starting point of the death rail. There also a war cemetery for the allied POWs who died in the construction of the railway. But there are only 3771 graves for most of the bodies were claimed by the jungle. The neatly maintained cemetery is under the administration of Common Wealth War Graves Commission. The Belu island is the largest island in Mon state, about the size of Singapore, close to Mawlamyaing. It is now connected by a bridge. The island was settled by sea-gypsies who are also known as “Salon people” before 250 B.C. Historians believed, they were driven away when Mon people arrived into that region. The island is famous for their handcraft industries-from slate tablets made from sediment stones to smoking-pipe, coconuts fibre-mats and rubber rings.